Taking another whack at this Zoomify/Leaflet thing after my post yesterday of London from the air in 1965. I shot this panoramic back on June 24, 2013 from a window of the Delta Armouries in Downtown London. Anywhoo, below is a zoomable look at portions of London’s east end, and northeast. A bigger version can be found here. 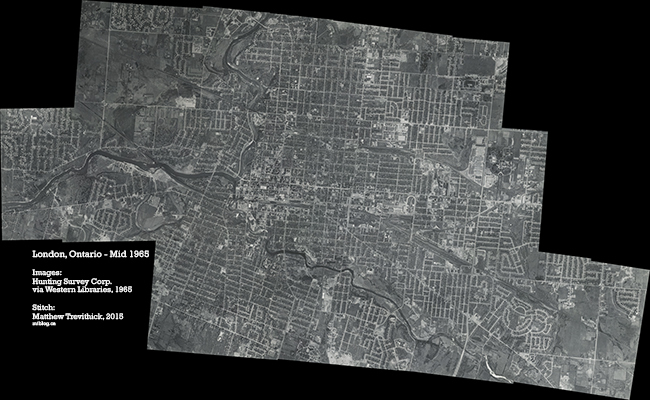 If you’ve ever wondered what London, Ontario looked like from above in 1965, well you can wonder no more. Similar to the composite of 1922 London aerial photos I stitched together in 2013, this one is made up of 21-or-so aerial photos taken in 1965 by Hunting Survey Corp. The photos currently reside at the Map and Data Centre in Western Libraries at Western University. The view you see here is all that the surveying covered. Some areas of the city missing include Clarke Road, and areas around the 401, among some others. Below is a zoomable version of the composite. You can find a larger zoomable version here.